Visit Chicago Botanic Garden on the cheap. The Chicago Botanical Garden (1000 Lake Cook Rd, Glencoe, IL 60022, (847) 835-5440) offers activities and programs year round. Walk through the beautiful scenery throughout the 385 acres, including 26 gardens, four natural areas, including prairie and woods, and 81 acres of water. Garden Guides and maps to the plants in each garden (Please note: not all locations have maps/guides). Admission to the Chicago Botanic Garden is always free (it’s part of the Forest Preserves of Cook County!) the catch is you have to pay for parking. For Cook County residents it’s $20 on weekdays and $25 on weekends and holidays. For non-Cook County residents it’s $25 weekdays and $30 weekends and holidays. Buy your parking in advance for faster entry. Terms and conditions apply. Recently an astute reader emailed me and said that they park for free at Turnbull Woods and then walk the 1.1 miles to the garden. See map below. Turnbull Woods is part of the Cook County Forest Preserves. If you have a rack you could also bring your bikes. Take the Metra Union Pacific North line with an $10 weekend pass (good for unlimited Metra rides on Saturday and Sunday) and get off at Braeside. Walk 1.1 mile from the station, down Lake Cook Road to the garden entrance where you will get in for free. If that’s too far to walk take your bike on the Metra. On weekends every train on the UP North line allows 20 bikes per train. Or take the Metra to the Glencoe stop (Sunday only) and for an additional $2 roundtrip take the Garden Trolley. Trolley service is provided to and from the Glencoe Metra Station on Sundays, 9:30 a.m. – 5:30 p.m. Sundays, May 8 – September 4, 2018. Garden members and children 5 and under ride free. If you want to go on a Saturday take the 213 Pace bus that leaves from the east side of Green Bay Road at the Glencoe Station. Ask the driver to stop at the Chicago Botanic Garden. View Hours of Operation for additional information. One way fare $2.00 cash or $1.75 Ventra. You can also bike, run or walk to the Botanic Garden. The one-mile link between the Green Bay Trail and the North Branch Trail. passes through the Garden’s McDonald Woods and through Turnbull Woods, which is part of the Forest Preserves of Cook County. View/download a map of the bike route on Garden grounds. Download a PDF of the map below. Pack a lunch, buy a Metra Pass (use the Ventra app), and take a trip out to the Botanic Garden for $8-$12! Chicago Botanic Garden traces its origins back to the Chicago Horticultural Society, founded in 1890. The Society hosted flower and horticultural shows. Its third was the World’s Columbian Exposition Chrysanthemum Show in October 1893. 1943 The Chicago Horticultural Society was restarted. 1962 the Society agreed to help create and manage a new public garden. 1965 the Forest Preserves of Cook County signed over 300 wet acres of lowland marsh at the north end of the Skokie Lagoons to the Chicago Horticultural Society. 1972 Garden opens. Master plan created by John O. Simonds and Geoffrey Rausch. 1976 Education Center known today as the Regenstein Center opens. Designed by Edward Larabee Barnes. 1975 The Japanese Garden, known today as the Elizabeth Hubert Malott Japanese Garden breaks ground. Designed by Dr. Koichi Kawana. 1991 English Walled Garden is dedicated. Designed by British landscape designer John Brookes. 2009 Plant Science Center opens. Designed by Booth Hansen. 2014 more than one million people visited the Garden’s. The Garden has 50,000 members—one of the largest memberships of any U.S. botanic garden. 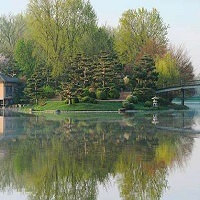 The Chicago Botanic Garden is owned by the Forest Preserve District of Cook County and operated by the Chicago Horticultural Society. Forest Preserve District provides about $9 million dollars annually or one third to the Garden’s annual operating budget. The Botanic Garden had total operating revenue of $33.1 million in 2014. The Botanic Garden endowment was $85.5 million in 2014. Membership, earned revenues, grants, and private donations provide two-thirds of the annual operating budget. The majority of capital investment comes from private donors and has been used to build new gardens and facilities. In recent years, state and federal grants have provided important funds for infrastructure projects, such as shoreline restoration and the garden wall.